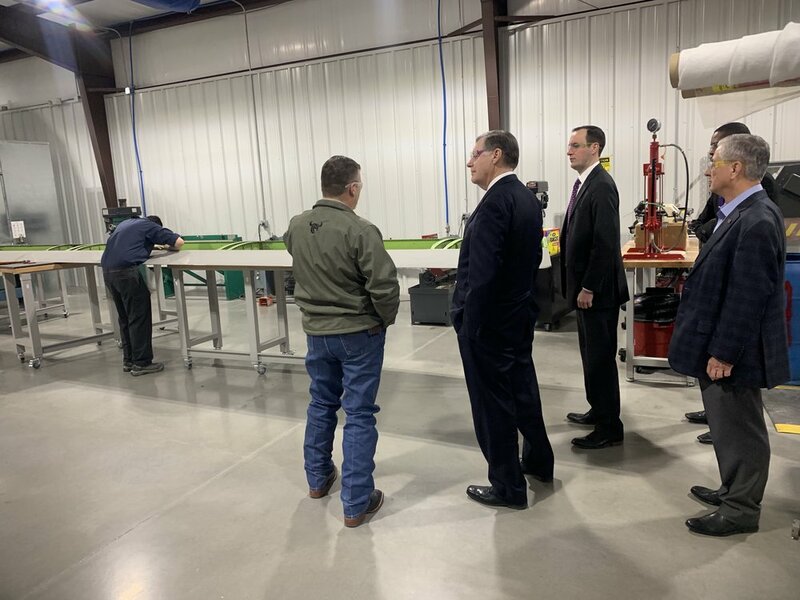 On Wednesday, March 20, 2019 Dow Aero Logistics, LLC (“Dow Aero”) welcomed Oklahoma Congressman Tom Cole to tour our facilities in south Oklahoma City. He was joined by Dow Aero executives Ronda Hudson-Dowding CEO/President, William Dowding Chief Operating Officer, and Raymond Ferreira Vice President of Business Development. The guided tour started with our state-of-the-art airstair repair and manufacturing facility. This facility houses airstair repair capabilities for a wide-range of Boeing 737 aircraft, in addition to Boeing 747-200 aircraft as well. The facility also houses airstair manufacturing capabilities for Boeing 747-200 aircraft. At the time of Tom Cole’s visit, Dow Aero was also performing a flap overhaul for a Boeing 747 aircraft, as one of many other capabilities we can offer our customers. Authorized Raethon MagnaStar repair center for MagnaStar C-750 Telecommunication Management Units (TMU) and MagnaStar C-2000 Air Radio Telecommunication Units (ARTU). Authorized Honeywell autopilot servicing center. Aircraft wiring harness repair and manufacturing center where Dow Aero designs and builds aviation wiring harness assemblies that meet custom specifications, while also providing wiring harness repair services for all types of aircraft and sub-systems. Extensive battery repair and overhaul service area for nickel-cadmium (NiCad) and lead acid batteries, along with power supply repairs. Tom Cole is currently serving in his ninth term for the Fourth District of Oklahoma.